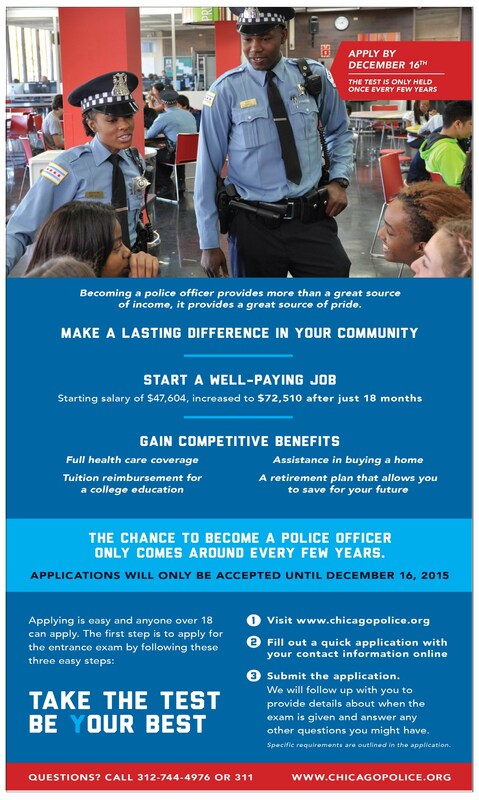 The Chicago Police Department has announced an entrance examination to become a Police Officer. This is an opportunity to increase the diversity within the ranks of the department, and an excellent long-term employment opportunity for our community. There are great benefits that come with being a Chicago Police Officer. We offer tuition reimbursement for college to our members, the salary puts you in a position to buy a home, and the city covers health care for you and your family. But it’s not just about the salary and benefits. You can have a huge amount of pride in serving the City of Chicago and helping people live safer, better lives.